"GreenGeeks" Reviews (Apr 2019) - Why 4.8 Stars? A full-service host with an eco-friendly twist, GreenGeeks provides high-performance and redundant SSD storage, while a bevy of bonus features further help customers thrive. By replacing three times the amount of energy used by servers and datacenters, GreenGeeks proves that environmentally sound hosting claims are more than just hot air. “It's hard to imagine something intangible, like a website, contributing to climate change. In fact, with millions of servers and thousands of datacenters drawing massive amounts of electricity, the web hosting industry is on pace to surpass air travel as one of the world's worst polluters. “Perfect for small business owners, bloggers, or web developers, GreenGeeks offers an impressive blend of features that appeal to all types of site owners. “The free site migrations offered by GreenGeeks makes sticking with the company a worthwhile venture as your website or application grows to new levels of hosting. The company's elastic platform allows for easy resource upgrades to make sure your growth is supported. “Geared for rapidly growing businesses and enterprise-level companies, GreenGeeks VPS plans provide the computing resources and scalability required to support and adapt to your growing traffic. Virtual servers are deployed in less than 60 seconds, and we appreciate the included cPanel and WHM licenses, root access, and site migration. “The GreenGeeks comprehensive suite of added features resonates particularly well with the company's managed WordPress hosting plan. Modeled after the GreenGeeks shared hosting package, the managed WordPress services will resonate with a wide cross-section of the ultra-popular content management system's enthusiasts. 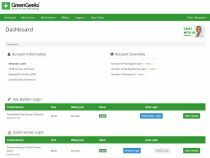 “Shared hosting customers can easily request access to the GreenGeeks website builder through the account management portal. Our site builder installation was ready to go within 40 minutes, and we appreciated the clear instructions on how to get started. Since the company's launch in 2008, GreenGeeks has put three times the amount of energy used back into the grid. The company purchases wind energy credits to offset the 1,390 pounds of carbon dioxides that each web server generates. As a recognized EPA Green Power Partner, GreenGeeks is the world's most environmentally friendly hosting provider. In addition to wind energy credits, the company uses energy-efficient hardware housed in datacenters designed to be eco-friendly. GreenGeeks promotes environmentally conscious behaviors and seeks to spread awareness by encouraging customers to include one (or more) of 26 green hosting accreditation badges on their website. GreenGeeks conducts disaster recovery backups each night for shared, reseller, WordPress, and VPS hosting customers. The backups, in addition to RAID-10 storage, are stored for 48 hours. Customers are allowed one free restoration per month. Many hosts offer free site migrations or transfers as a welcoming present for new customers, and GreenGeeks is no exception. Shared hosting customers receive one free migration, while reseller, VPS, and dedicated customers can take advantage of up to 30 cPanel transfers. GreenGeeks rolled out an all-SSD infrastructure in 2014, dramatically improving page loads by 50% to 100%. Combined with RAID-10 storage arrays and default PHP 7, GreenGeeks hosting environments are both speedy and secure. Issues are resolved in an average of 15 to 20 minutes, with the fastest and most accurate support requests coming through the online account manager. Alternatively, the company holds extensive phone support hours and live chat is available 24/7/365. Hundreds of how-to guides and tutorials walk customers through various aspects of website management, including for WordPress, Drupal, Joomla, Magento, and email configuration. GreenGeeks boasts an extensive knowledgebase, covering everything from general hosting questions to articles explaining how to use and configure add-on services such as CloudFlare, SiteLock, and OneClickSSL. GreenGeeks provides a free ClientExec license to resellers looking to automate client management. Combined with cPanel and WHM, resellers can enjoy efficient invoicing, technical support, provisioning, and payment processing. Customers transferring their website to GreenGeeks from another provider — including those who purchase hosting services through a reseller — can enjoy a free migration. The free service covers up to 30 cPanel accounts. An included eNom domain reseller account enables aspiring hosts to register domains for their customers. Resellers can integrate the eNom account into ClientExec to automate billing and provisioning. The GreenGeeks account manager portal carries a refreshingly light and streamlined design but doesn't scrimp on functionality. Users can quickly register a new domain name, request a site migration, or adjust billing information. We also appreciate that the company gives customers an easy option to contact support agents through live chat, instead of automatically routing them to the ticket system. 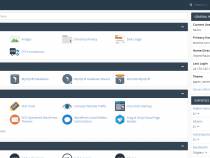 In addition to a seamless shared hosting cPanel integration, the familiar interface is included for free with VPS plans, as well. Resellers will appreciate the ability to offer unlimited cPanel accounts to their customers. 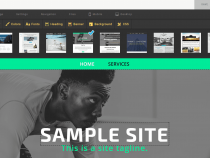 Customers looking to use the free site builder won't be disappointed. The straightforward platform features movable content blocks that snap to a grid, ensuring nothing gets out of place. After choosing a template, we appreciate how the website builder will auto-fill your contact information and offer previews of your site on both mobile and desktop. Ever-so-slightly more expensive than our most affordable recommended hosts, GreenGeeks is in fact priced very competitively with other hosts utilizing all-SSD infrastructure. We have no problem paying an extra dollar or two a month for the upgraded hardware, especially with all the other bonus features GreenGeeks includes in hosting packages. The excitement surrounding a high-quality hosting bargain, however, begins to wane at the more advanced levels. We have no qualms about GreenGeeks VPS service but have a hard time understanding a price tag that is twice as much as our other top VPS hosts. Dedicated servers are a slightly better bargain, but GreenGeeks remains one of the more expensive options in this space, as well. GreenGeeks offers the standard 99.9% uptime guarantee — expected, if not exciting or extraordinary. How GreenGeeks makes up for it, though, is through RAID-10 storage configurations with speedy solid-state drives, along with free nightly backups and restorations. We'd love to see an extra nine at the end of the uptime guarantee but have every confidence in GreenGeeks to keep customers' content online and available. Although we prefer live chat support to sterile and distant email tickets, GreenGeeks posts remarkable response and issue resolution times. Live chat and email support is available all day, every day. For those customers who prefer to call technical support, GreenGeek technicians will answer from 9 a.m. to midnight on weekdays and from 9 a.m. to 8 p.m. on weekends — stellar hours when 24/7 isn't possible. Wondering how GreenGeeks stacks up againt other web hosting services? See our host-vs-host reviews below and compare them side by side. 5 out of 9 times. The GreenGeeks mission to make a positive environmental impact through energy-efficient web hosting is admirable and surprisingly lacking in the industry. Regardless of the feel-good vibes you get at signup, however, the company is a strong option for customers looking for all levels of services. GreenGeeks gets our highest recommendations at the shared hosting tier, which includes separate plans for managed WordPress and website builder configurations. The upscale GreenGeeks features, including unlimited RAID-10 storage, SSD performance, free migrations, and nightly backups, resonate the most strongly when combined with the shared hosting services' ultra-competitive pricing.